Deliciously deep fuchsia fossil coral, plus two translucent garnet cabochons adorn this one of a kind necklace fit for a queen. With a substantial pendant coming in at approximately 3 x 1 3/4 x 3/4 inches and a 16 inch heavy sterling silver chain, this piece is my interpretation of the heart reliquary of Anne de Bretagne. 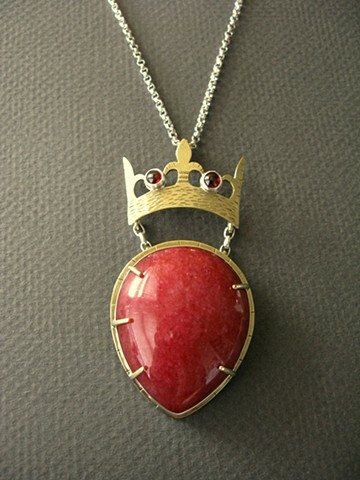 The back of the pendant reads "The Greatest", making it the perfect gift for the queen of your heart. Anne was a 15th century queen, patron of the arts and fierce defender of her homeland of Brittany. After her death, her heart was placed in a golden reliquary, inscribed with the words that "in this little vessel of fine gold, pure and clean, rests a heart greater than any lady in the world ever had."